You don't have to feel sorry for Picaro anymore. He's been to the brink of death, but now it looks like he's back for good. The gutsy 14-year-old Paso Fino stallion, who was shot in the face and head by his suicide-driven owner in Spencer, MA in the pre-dawn hours of January 14th, is not only recovering from his life-threatening wounds, he's starting to thrive. Bleeding and in shock, Picaro had been rushed to Tufts' Cummings Hospital for Large Animals in North Grafton within hours after sustaining his terrible injuries. 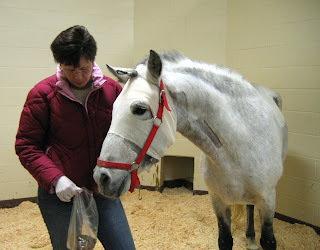 He was stabilized by the veterinary staff there, and put in the care of Drs. Carl Kirker-Head and Jose Garcia-Lopez, who operated on him the next day. The prognosis was grim: Picaro's right eye had to be removed, as did multiple bone fragments in his jaw and face. Within a few days, three-dimensional CT scans of Picaro's head revealed that more reconstruction work was needed, so Dr. Kirker-Head and his team went in again, this time stabilizing the horse's badly damaged right jawbone and shattered hyoid apparatus. That's when the hard work began.